The Integrated Crop Pollination Project has released the summary report from its 2015 survey of Florida blueberry growers’ pollination practices. Earlier this month, the project team published the summary from a parallel survey of Michigan blueberry growers. The survey of 69 blueberry growers in five Florida counties (Alachua, Jackson, Lake, Marion, and Polk) delved into growers’ goals for pollination management, networks of information sources about pollination, and past, current, and potential future practices related to managing and supporting pollinators on blueberry farms. Relative to Michigan blueberry growers, Florida growers were slightly less likely to report using managed honey bees for pollination (61% of Florida growers buy, rent, or own managed honey bees, compared with 79% of Michigan growers). 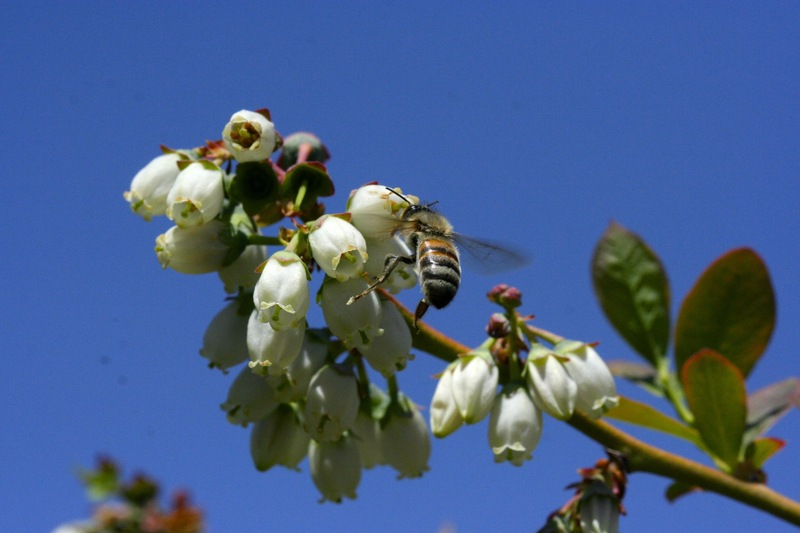 However, Florida blueberry growers reported more widespread use of managed bumble bees for pollination, both alone and in combination with honey bees, than Michigan growers. Just over half of Florida blueberry growers reported using reduced-risk pesticide practices to help protect pollinators. By comparison, the previous summary report from Michigan blueberry indicated extensive adoption of practices that minimize the risk of pesticides to bees, with over 90% of surveyed Michigan blueberry growers reporting changing the timing of pesticide and fungicide applications to minimize the risk to bees (e.g. spraying at night) and choosing active ingredients with less toxicity to bees. The research team will be conducting a follow-up survey in winter 2016-2017 in Florida and other states surveyed in 2015 (including Michigan, Oregon, and California) to continue learning about pollination management practices.